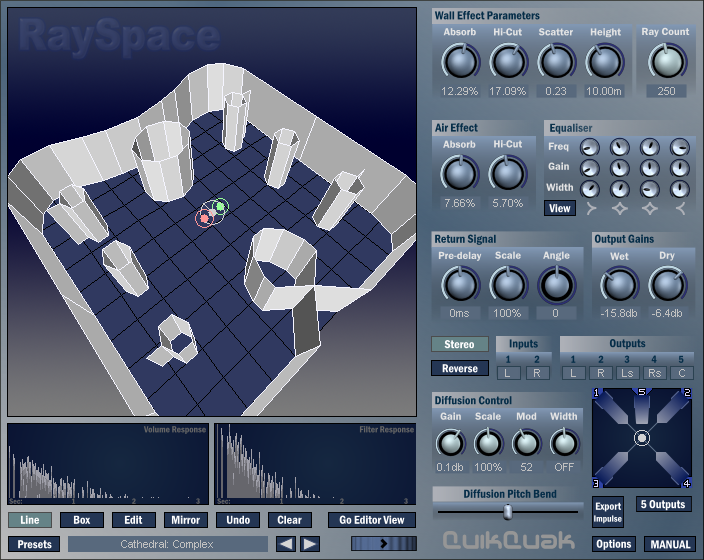 RaySpace is a completely new acoustic simulator. This unique reverb introduces the new DBT engine that creates fantastic surround-sound atmospheres. The characteristics of the room shape, height, positions and materials can all be adjusted in real-time. Combined with the 3D view and the parametric equaliser, the user is given the complete audio and visual feedback of room designs! With full automation, source and listener positions can be 'walked' though the rooms, ideal for patching dialogue in radio plays or films. From concert halls to bathrooms, cathedrals to sewers, you can play and sing anywhere you desire! New GUI: Icy cool, with cleaner lines and easy on the eye.